Enjoy unparalleled downtown views, luxury apartment living, and the best location in Midtown Houston, at Camden City Centre. Our pet-friendly studio, one and two bedroom apartment homes are minutes away from Downtown Houston and within walking distance of everything else. Forget wasting your life stuck in traffic and have more time for what’s important – living! View our available floorplans. 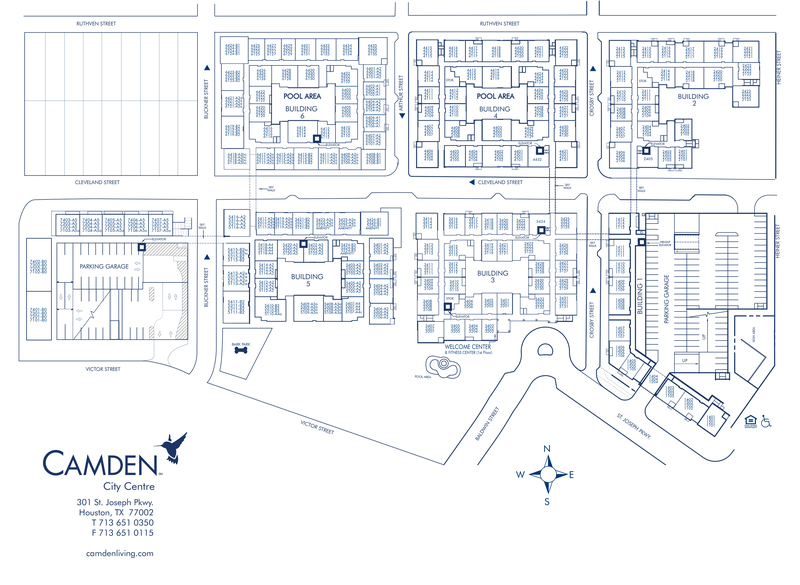 For your apartment home, we have the perfect layout to meet your budget, needs and wants. Choose from spacious studio, one or two bedroom floor plans complete with stainless appliances, 10-foot ceilings, full-size washers and dryers, and luxurious garden tubs. Select homes feature granite or quartz countertops, polished concrete or wood-style floors and built-in desks. Love a modern apartment-style with quartz countertops, subway backsplash, and custom cabinetry? We've got those too! Our pet-friendly community offers an oasis of amenities to relax after a long day or revitalize for a night in. Enjoy the three resort-style pools with water features and sun decks, or play some shuffleboard, poker or billiards in the Gaming Lounge complete with flatscreen TVs and WiFi. Invite your friends to watch the Houston Texans game at our onsite Movie Theater, or let your inner chef shine at one of the outdoor grills and dining areas. Stay in shape with two High-Endurance Fitness Centers with cardio and free weights. Get down to business in our complimentary conference room with coffee bar. We even have a private Dog Park with an agility course and pet wash station for our four-legged residents! Up to three pets are allowed per apartment! Residents receive a technology package included in their total monthly rent with a savings of up to 55% off retail. This money-saving package includes high-speed internet up to 150 Mbps and over 140 digital video channels through Xfinity. Use the Xfinity Go app on your smartphone or tablet to access your digital video anywhere! When it’s time to venture out of your Houston Midtown apartment, walk to more than 140 restaurants and bars including Cyclone Anaya's, Ibiza, Mr. Peeples and The Fish, plus Christian’s Tailgate or Front Porch Pub. Say goodbye to long commutes with access to US-59, I-10, I-610, I-45 and 288. Or just ditch the car completely and walk to the METRORail and Downtown Tunnel System. Live just minutes from the Museum District, Medical Center and all four major league stadiums. No matter where you’re from, welcome home to Camden City Centre. It’s time to start living in one of the 10 best-rated apartment communities in Houston. Breed Restrictions: American Pit Bull Terrier, American Staffordshire Terrier, Staffordshire Bull Terrier, any mix of the previous breeds, or any other dog or breed deemed aggressive. See management for pet approval. Get the perfect spot! We have ample parking garage access for residents' registered vehicles. Residents can reserve assigned visitor parking within the parking garage for $15 per month. Free visitor parking is available outside the parking garage at street level.